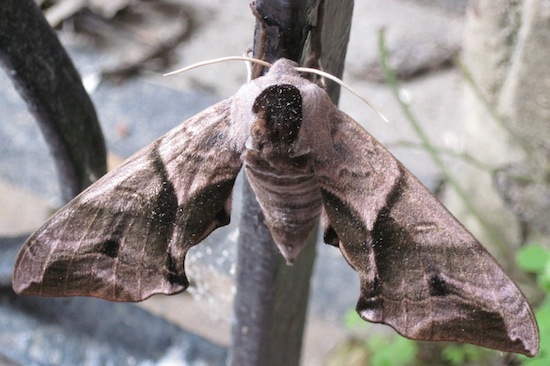 The Eyed Hawk-Moth, so called from a large and beautiful spot in each of the hind wings that somewhat resembles an eye. The fore wings are brown, with a very beautiful reddish bloom over them, and clouded with olive-brown. The hind wings are of a delicate rosy red at the base, and a pale brown towards the margin; and each has a large and beautiful eye-like spot, grey in the centre, surrounded with blue, and the blue surrounded by a black ring. The skin of the caterpillar is rough, like shagreen; it is pale green, sprinkled with white, and has seven oblique white stripes on each side. The horn at the tail is blue. It is very common in the autumn, feeding on apple trees in gardens, and on willow bushes in hedges. The chrysalis is red-brown, and glossy. The Moth is found about Midsummer. Unfortunately the one that stayed briefly on my front doorstep only showed the smallest peep of its eyes.